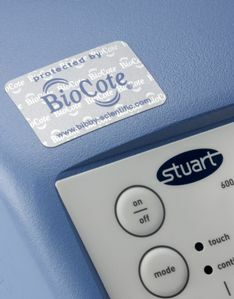 A two-month environmental study has shown that silver-based BioCote® antimicrobial protection, an integral feature of all Stuart® benchtop laboratory equipment, reduces bacterial contamination of instrument surfaces by over 96 per cent. The study was carried out at the University of Birmingham, in a laboratory conducting research for Cancer Research UK. Bacterial surface contamination of six BioCote-treated Stuart instruments, such as hotplate stirrers and a mixer, was compared with untreated centrifuges, a biophotometer, and fridge and incubator handles. Swabs from touchpads, switches, casings etc. were collected fortnightly for two months and Total Viable Counts (TVC) obtained after inoculation and incubation of plate count agar. Results were dramatic: a mean reduction in excess of 96 per cent in the TVC of bacteria contaminating the BioCote treated equipment, compared with untreated control items in the same environment. All items included in the study had previously been in routine use in the laboratory for around 18 months.